Dolph Lundgren plays a tall and occasionally sleeveless cop who is trying to crack a corrupt businessman when a very inconsiderate alien drug dealer lands on Earth and gets all up in his square face. 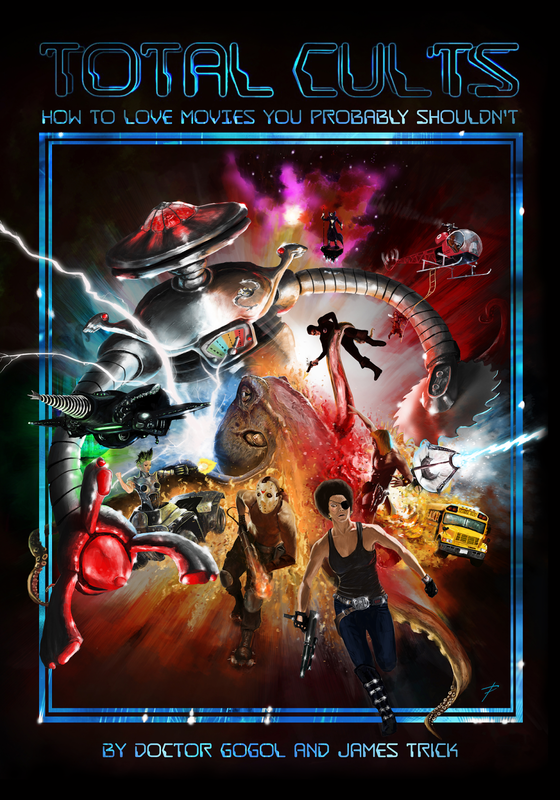 Teamed with pint-sized partner Brian Benben and a wounded space narcotics cop they must bring down the alien dealer, who harvests his drugs direct from the human brain, before the human race becomes fair game for an army of extraterrestrial pushers. 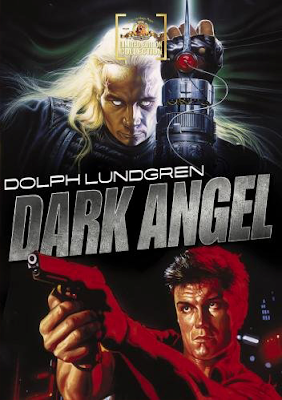 Liberally borrowing from The Terminator and Predator, Dark Angel leans into its derivative nature and its all the better for it. 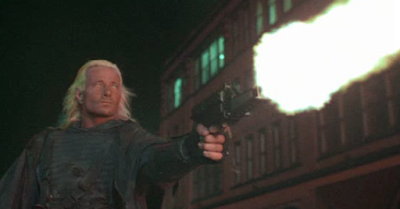 The alien dealer, played by B-movie action mainstay Mathius Hues, is a black clad, pupil-less beast armed with some awesome sci-fi weaponry. Aside from his wrist mounted drug extraction kit (a coil that injects heroin into its victim which stimulates endorphins so that he can then harvest them by sticking a spike into their forehead) the alien can launch a flying razor disc/CD that bounces around the room slicing the throats of its targets. He also has a wicked space pistol. It's actually a very real Calico 950 that thanks to its funky design is the default model that productions use when they want a futuristic gun but can't afford to make one themselves. In this case the gun has four settings that give the weapon varying degree of explosive power. Ultimately when the trigger is pulled things blow up - spectacularly. 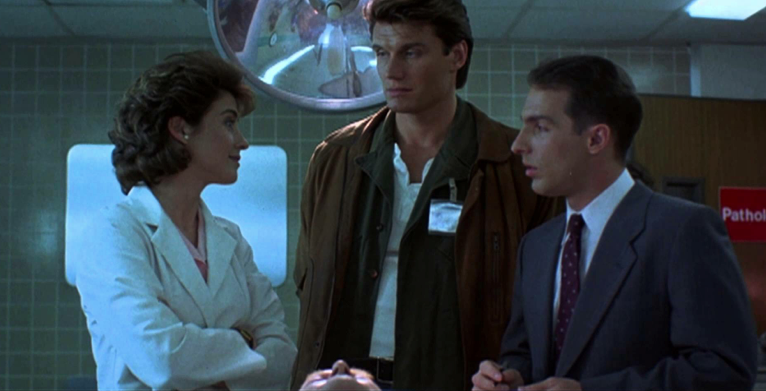 Despite looking and feeling like most straight-to-video action movies of the early 90s the movie doesn't skimp on bang for its buck. 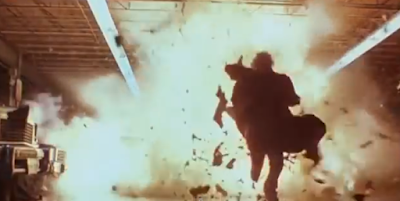 This movie has so many explosions it could give Michael Bay an inferiority complex. The rest of the action is pretty good. Nothing approaching John Woo levels of gunplay but is all satisfyingly rendered. What really makes the film work is that it is genuinely funny and this is primarily due to a cast that has been filled out with performers of real texture. Whether it is a caffeine addled scientist, Lundgren's weary ex-girlfrined or the sleeze-ball corporate enforcers everyone brings a little pep to what could otherwise be forgettable roles. Its Benben, though, that steals the show. He essentially plays the stiff by-the-book agent assigned to keep Lundgren's scruffy rogue on a leash but surprisingly he also gets to play the comic relief. Benben gets some good lines and plays them in such a way that even Lundgren ends up looking good. 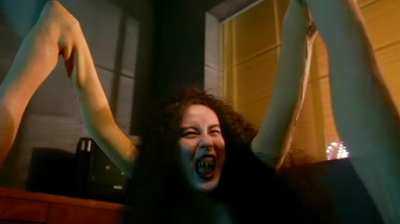 Dark Angel knows its audience and its place and works every angle. Its derivative but uses that to springboard into some interesting areas, its funny yet also gives your traditional action audience everything they want. Its not flashy or expensive enough to complete with the a-listers of action but it stands head and shoulders above anything else of its ilk. Well worth a look.